"Startup communities" are popping up everywhere, from cities like Boulder to Boston and even in countries such as Iceland. These types of entrepreneurial ecosystems are driving innovation and small-business energy. 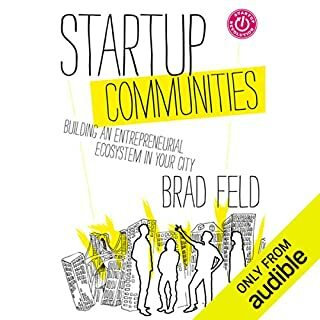 Startup Communities documents the buzz, strategy, long-term perspective, and dynamics of building communities of entrepreneurs who can feed off of one another's talent, creativity, and support. Would you listen to Startup Communities again? Why? Lots of solid advice and specific items that I'd like to research in more detail. Would you be willing to try another book from Brad Feld? Why or why not? Very US specific, some advice extremely tough to implement, specifically about the role of government. In the Middle East, with high friction between borders, government plays crucial role at least logistically and bureaucratically.. .